NOW IN STOCK: This page is primarily for advanced users or those with sophisticated weather monitoring requirements and assumes some knowledge of the existing VP2 and Envoy products. The 6318 Envoy8X is a fascinating new addition to the Vantage Pro 2 family that considerably enhances the breadth of data logging that a VP2 system can offer. The key feature of the Envoy8X is that it can listen to and log data from all eight VP2 wireless channels simultaneously, irrespective of the type of VP2 station transmitting on each channel. So, for example, the Envoy8X can log from up to eight VP2 ISS units at the same time (Remember that the standard VP2 console can listen to only a single ISS unit.). 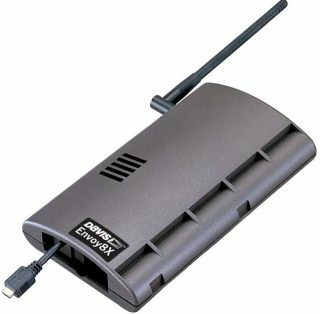 Note that there is no cabled Envoy8X version – it is a wireless-only unit. Unsurprisingly, these greatly expanded logging capabilities have required a step-change in the logging software used. 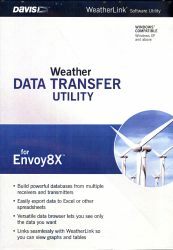 The Envoy8X no longer uses the Weatherlink program (directly at least) but instead logs to software known as the ‘Weather Data Transfer Utility for Envoy8X’. This new program – as its name suggests – is primarily a data management tool, storing all of the logged data in an SQL-type database. Beyond a tabular data browser, there are no data analysis or presentation features in the WDTU program – these functions are clearly expected to be handled by other downstream programs, a process that will be made easier by the SQL-type data access now possible. The Envoy8X is clearly a more specialist console type and so is less likely to be specified by users looking just for a straightforward, standard VP2 station. Also, for the time being at least, the Envoy8X firmware/software does not provide a real-time data stream, with data access being limited to archive downloads (though enhanced data granularity down to a 10 second archive interval is a significant new feature); so any user wishing to run, for example, live weather webpages will need to continue to use one of the standard VP2 console types. The Envoy8X console is superficially identical to the standard Envoy console, other than its prominent ‘Envoy8X’ label. Closer inspection reveals an extra RJ11 socket alongside the DC power socket (for attachment of an external temperature probe), but otherwise the Envoy8X is indistinguishable in look and operation (including eg internal batteries) from the standard Envoy model. As with all Envoy consoles, the unit must be fitted with a Weatherlink data logger if it is to do anything useful. Note that the Envoy8X seems to be compatible only with 6510USB and 6510SER – no other loggers (including the 6555 WeatherlinkIP unit) are compatible. The key new features of the Envoy8X console are summarised in a little more detail below and then a more thorough description of the dedicated WDTU software follows. The most important enhancement is that any combination of sensors that the Davis Vantage architecture allows can now be logged simultaneously. (The two main rules are that all sensors – other than the Envoy8X’s inside temp/hum and pressure sensors – must be attached to a Vantage wireless transmitter and that a maximum of eight transmitters per system is permitted.) Previous limitations with the standard VP2/Envoy systems that data from eg only one ISS or one anemometer can be logged at any one time are now swept away with the Envoy8X. The central function of the WDTU software is to download the logged archive data from the Envoy8x/logger combination and to save it to a local database. NB There is no mention within the Envoy8X documentation of any analogue of the real-time Loop packets available from the standard VP2 consoles. It does appear that marketing of the Envoy8X will initially focus around its use for logging potentially large amounts of multi-sensor archive data downloaded at intervals rather than as a source of real-time data. With the release of WDTU v1.1 it is now possible to schedule automatic data downloads from the Envoy 8X logger (this feature was missing from the initial v1.0 software release and all downloads had to be manually triggered). The main screen in the WDTU program will typically show a tabular display not dissimilar to the Browse display in traditional Weatherlink, with the rows being the set of consecutive archive records and the columns corresponding to the individual weather parameters. This WDTU browser display can function as a viewer into the database being used and hence can offer – if appropriately configured – a consolidated view into all of the available data, irrespective of the VP2 transmitter from which it was sourced. Because of the large number of columns that could potentially be displayed, a key feature of the WDTU browser is an option to define which particular subset of columns should be selected for display. (See image below for an example.) Another option is to set the units to be used for display of each data category, although the underlying data seems to be held in a single, fixed, native format. Three types of database are supported by WDTU: MS Access, MySQL and MS SQL Server – there are pros and cons of cost, robustness, convenience etc to each type. Access is the simplest but least flexible/robust option. Use of MySQL (free) and SQL Server (potentially significant cost) requires the user to have the appropriate database environment also installed. Multiple database tables, one per transmitter type (eg ISS, leaf/soil) or for certain weather parameter types (eg wind, rain, raw) together with others for admin data (configuration, reception stats etc) are used to build the overall database structure, with all data values seemingly held in native Weatherlink format. Export to Excel creates a CSV file containing data from all of the rows and columns currently selected for display in the WDTU browser (see right). The Excel export will use the same units as are currently set for the WDTU display. If Excel is already installed on the PC in use then Excel will open and display the selected data as a spreadsheet.